The global ocean has a key role on the Earth’s climate system. It possesses a direct connection with the atmospheric gases, including the greenhouses, allowing exchanges between those compartments and oceanic storage of carbon. Through the years, this exchange of gases occurred based on gas equilibrium between ocean and atmosphere. After the Industrial Revolution, human activities have increased the emissions of greenhouse gases, mainly carbon dioxide (CO2), which changed the atmospheric concentration from ~280 ppm of CO2 to values as high as 391 ppm between c.a. 1750 and 2011 (Ciais et al., 2013). Recently, the measured CO2 atmospheric values are ranging near or above 400 ppm, as recorded by the Mauna Loa observatory, in Hawaii (daily CO2 measurements information available on www.scripps.ucsd.edu). A regional study in the south-southeast Brazilian continental shelf agrees with this value, which has measured an average of 396.7±2.5 ppm in the atmosphere during the spring of October 2014 (Kerr et al., 2016). This enhancement is reflected in the ocean, which has absorbed about 25% to 30% of the anthropogenic atmospheric CO2 emissions (Sabine and Tanhua, 2010); Le Quére et al., 2016). 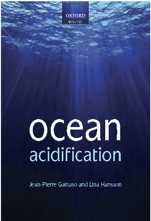 The CO2 uptake by the oceans directly affects the seawater chemistry and marine biogeochemical processes, impacting both the ecosystems and their respective biota (Doney et al., 2009). Perretti A. R., Rizzatti de Albergaria-Barbosa A. C., Kerr R. & Cortim da Cunha L., 2018. 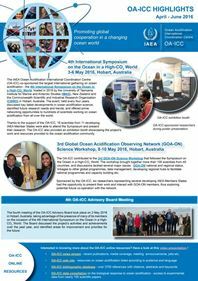 Ocean acidification studies and the uncertainties relevance on measurements of marine carbonate system properties. Brazilian Journal of Oceanography 66 (2): 234-242. Article.